Are you raising an animal lover? If so, chances are they’ve already asked for a puppy, kitten, guanine pig, lizard, snake or bird of their own. 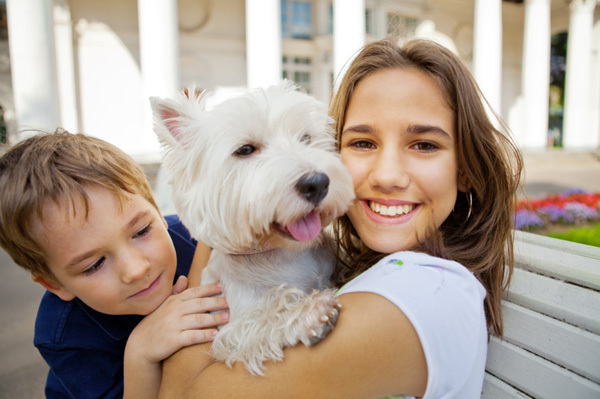 Bringing home a pet is a big decision and shouldn’t be taken lightly – especially if you have young kids in your home. I’ve put together some tips and advice to help ensure your decision is the right one – whatever that may be. Pick the Right Pet: There are lots of different pets to choose from. In our case, my wife and I already had two small dogs prior to having kids. Our dogs are old now, but when my toddlers began asking for other pets we decided on fish. It gave the kids extra responsibility because they had to help feed the fish and keep their bowl clean. This has worked quite well for my family, but your family might be completely different. It’s important to determine which pet is the right fit for your family, as all pets are different; they require different sorts of attention and lead different lives. Don’t rush into anything. Make certain your decision is thoroughly thought out as pets are a big commitment, and your new pet will be a part of your family for up to 20 years or more in some cases! Get the Supplies: Once you determine which pet is right for your family the next thing you’ll need to do is pick up all of the necessary supplies. I suggest picking up all of the supplies before you bring your new pet home. Bring your child with you to pick out the supplies and let them help, so you can talk to them about the different things you’re buying and what they’re for. Do some research prior to heading out and ask questions while at your local pet store to ensure you get everything your new pet will need. Involve Your Child: Involve your child in the process as much as possible and use every opportunity to reinforce responsibility while still allowing for excitement and anticipation. Read books, watch movies and television shows that discuss the importance of properly taking care of a pet and how kids can help do just that. Allow your child to help choose which type of pet and which type of breed you’ll be bringing home, and encourage them to do research in order to figure out what pet will be best for them and the family. If you have multiple children I suggest you hold a family meeting where each child can give their own input and express their excitement and concerns. Be Responsible: Purchase your pet from a responsible breeder or adopt one from a local shelter if possible. If you need further education or help once your new pet comes home, sign up for classes; there are now classes on everything from safe snake handling to puppy basic obedience – you’re not alone! Whatever you do, make sure you’re fully prepared and ready for the new experience prior to bringing your new pet home!